What is a 5.13 Climber? West Virginia offers some of the finest rock climbing in the eastern United States. The stunning sandstone conglomerate cliffs of the New River Gorge in Fayette County yield hundreds of routes of all degrees of difficulty. Seneca Rocks in Pendleton County provides multi-pitch climbing on a Tuscacora sandstone fin. The U.S. military used Seneca Rocks during World War II to train troops in mountaineering before the invasion of Italy. 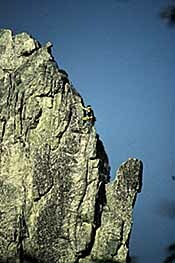 Usually, climbers making roped ascents of rock routes climb in pairs. One person "leads" the climb by climbing first and placing "protection," or "clipping" already fixed bolts. While the leader is climbing, his or her partner manages the rope that the leader has tied onto his/her own or partner's harness via a piece of equipment called a "belay device." If the leader falls, the "belayer" uses the belay device to stop the rope from running and thereby catches the leader's fall. When the leader reaches the top of the pitch (one rope length or less), he or she secures the rope to an anchor. The leader then becomes the belayer and belays his/her partner as he/she climbs the route and "clean," or remove, any non-fixed gear that the leader placed. All climbing routes receive a number from 5.0 to 5.14d to describe their difficulty. The 5 indicates that the class of travel is indeed climbing that requires technical movements and safety equipment (class 1 travel = walking, class 2 = hiking on loose terrain, class 3 = scrambling on challenging terrain, class 4 = intermittent climbing, scrambling, and hiking on challenging terrain). The number after the decimal point denotes the approximate difficulty, with .0 being the easiest of routes and .14d being the most difficult. Ratings are, of course, subjective, but provide a general guideline to a route's challenge level. Traditional (Trad.) Climbing: Traditional climbing requires that the leader place specially-designed equipment called "protection" (cams, nuts, hexes, etc.) into cracks and fissures in the rock. The climber then clips the rope to the pieces of protection so that the gear will assist in arresting a fall if he or she should slip. Sport Climbing: When a route lacks features in which to place traditional gear, often a climbing party will "bolt" the route. Drilled into the rock, the "bolts" remain in place for future parties to use. Sport climbing involves the leader clipping "quickdraws" onto the bolts and then clipping the rope into the quickdraws for protection. Toproping: When climbers "toprope" a route, they secure the rope to an anchor at the top of the climb before attempting the route. When toproping, the climber does not need to place any gear while climbing. Toproping is a very safe way to learn to climb. Bouldering: Bouldering refers to climbing short pieces of rock (usually under 20 feet) without a rope. Indoor Climbing: Indoor climbing gyms offer simulated outdoor climbing on walls fitted with plastic holds. Copyright 2000 by Wonderful West Virginia magazine and the WV Division of Natural Resources. Used with permission. All rights reserved. Photos are the property of the individual photographer(s) and may not be reprinted or reposted to the web without their permission. Click here to view the latest edition of Wonderful West Virginia, the official magazine of the Mountain State.